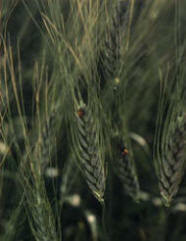 Kamut® is a registered trademark of Kamut International, Ltd., used in marketing products made with a remarkable grain. The new cereal is an ancient relative of modern durum wheat, two to three times the size of common wheat with 20–40% more protein, higher in lipids, amino acids, vitamins and minerals, and a "sweet" alternative for all products that now use common wheat (Fig. 1). Nutritionally superior, it can be substituted for common wheat with great success. Kamut brand wheat has a rich, buttery flavor, and is easily digested. A hard amber spring type wheat with a huge humped back kernel, this grain is "untouched" by modern plant breeding programs which appear to have sacrificed flavor and nutrition for higher yields dependent upon large amounts of synthetic agricultural inputs.